For a long time, teeming fans of veteran actress, Clarion Chukwura have waited patiently to see their darling screen diva on the silver screen but all to no avail. This latest information will surely give them a sigh of relief as they don't have to wait any longer to watch their star in a new flick titled 'Hustler'. 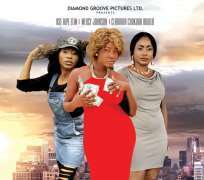 The movie is produced by Elvis Chuks and has Mercy Johnson, Chelsea Eze and Nse Ikpe Etim as few of the casts.